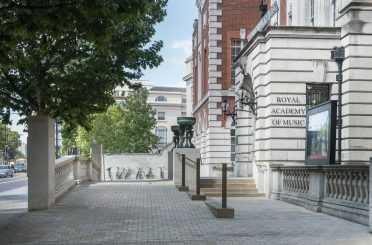 The Royal Academy of Music offers public events and prides itself in being an integral part of the community, promoting an inclusive learning environment which extends to providing access for all. The growth of the Academy over the past century has resulted in changes of level internally and externally, preventing visitors with disabilities from reaching many areas of the building. 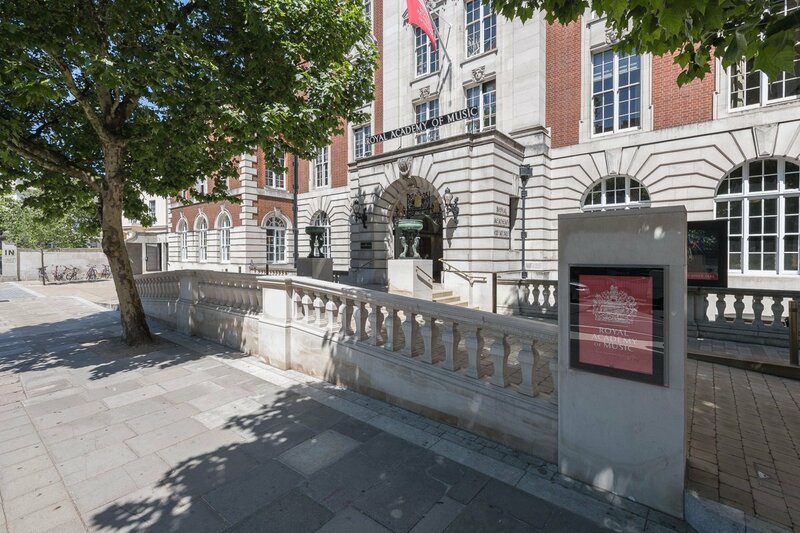 After providing historic building advice for Ian Ritchie Architects’ award-winning auditorium, we were approached by the Academy to re-design the approach to the main entrance to its Grade II listed building, with the objective of offering all users and visitors the same welcome, giving them parity of esteem. The entrance was originally reached by a flight of steps from an asphalt paved forecourt with a lay-by for taxis and delivery vans; wheelchairs and heavy objects such as pianos needed to be brought round the side, or heaved up the steps, lacking dignity. As part of the ongoing major internal refurbishment works, in-depth consultation with the client allowed us to fully understand the needs of the current and future user groups. This fed directly into our design and discussions with the Local Authority Planners, Building Control and Transport for London. The resulting new forecourt has been re-planned; the lay-by has been re-arranged as a raised platform accessed by ramps on both sides, with step-free access to the main entrance. On the road side, a balustrade using the same details as to the front area of the Academy provides protection from traffic. The end piers include noticeboards for future performances. On the Academy side, steps with handrails provide easy access. Bronze urns, salvaged from alterations in the 1970s, define the corners between the steps and the ramp. Planning and listed building consent was granted following justification for the proposals as offering the greatest public benefit with the greatest retention of the Grade II listed Academy’s historic fabric. 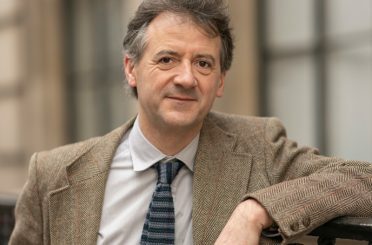 A number of alternatives were considered. These were generally cramped, making the movement of large objects problematic, with only single direction operation, and none combined respect for the historic character of the Academy with comfortable compliance with the Building Regulations. The approach provides a single ramp for both vehicular and pedestrian use, allowing all visitors to enjoy the same experience on the approach and entrance to the building. The new shared forecourt area has been laid with tactile stone setts to mark the boundaries of the pavement and the entrance. The use of dark granite setts and smaller York stone setts at the bottom and top landings of the ramp and steps show the changes in level. Brass strips have been inset into the main steps to denote the nosing of each. A new Portland stone balustrade is complemented by brass handrails to the entrance and side piers. The ramp is wide to provide a drop off zone and level access as well as space for multiple users of the ramp and steps at any one time. As the new ramp is part of a Grade II listed building, the intervention, design approach and material choices had to be carefully considered and suitable for the setting. The use of materials of different colours and tactile surfaces to sensitively denote the changes in level was something which was considered carefully. 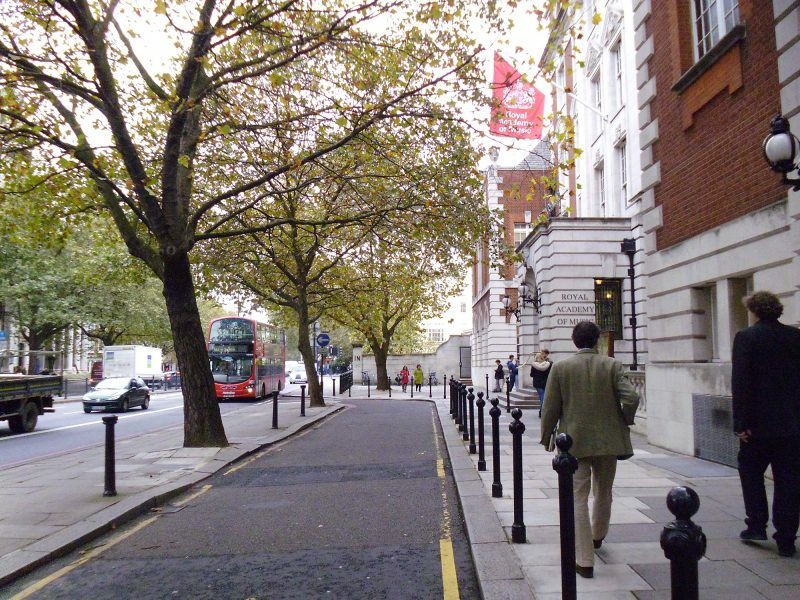 With regard to the wider setting, we were able to retain the integrity of the avenue of trees along Euston Road, re-locating one tree, as well as the existing pavement widths and traffic entrances and exits. The design of the ramp gives permanent access for all users into the building through the main entrance, ensuring all visitors are treated the same, with no segregation of groups with different abilities. The ramp caters for a diverse range of abilities, with both ramps and steps available to visitors. With a choice of methods of use, the ramp or steps can be used with the option of right handed or left handed access. The width of the ramp and wide flights of steps provide space for several users simultaneously to use the entrance at their own speed, as well as plenty of space for users with personal assistants. Educational institutions based in historic buildings and places can face particular challenges in providing improved access to visitors. Many historic buildings were not designed to meet current expectations of equal access. However, with specialist guidance, it is possible to make creative and subtle interventions to ensure all students, staff and visitors can enjoy parity of esteem and access. Please do not hesitate to contact us should you wish to discuss how we might be able to solve any access related issues within your building.